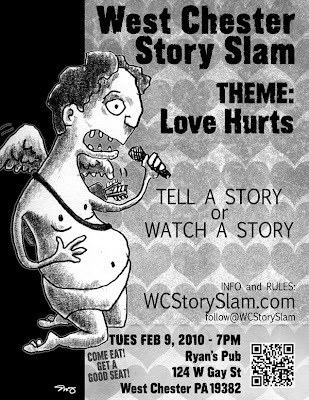 The February West Chester Story Slam poster for the theme Love Hurts. The first story slam even of the year last week was terrific – really impressive how many people turned out and how many had the gumption to get up and tell a story. Here’s Shirley Landis Van Scoyk’s winning story for January’s theme, Embarrassing Moments. This entry was posted in cupid, poster, story slam, west chester pa. Bookmark the permalink.